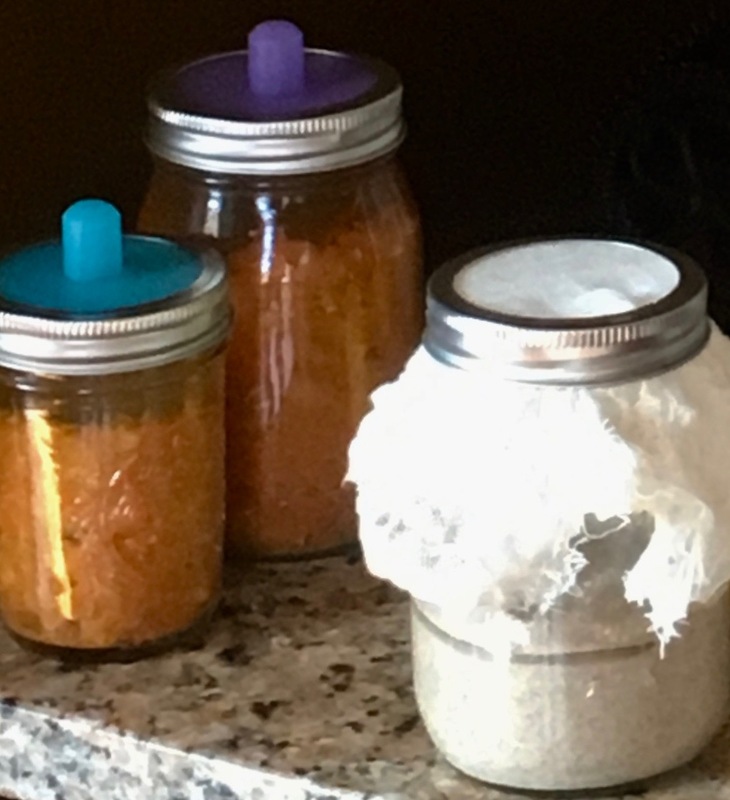 I’m also cultivating water kefir, an alternative to whey, to make natural soda with, and trying out my first kombucha culture, which still has a couple weeks of fermenting to go…. It’s amazing to me how my generation is able to be almost completely ignorant of basic knowledge that has been passed down for thousands of years. Really, my sisters and brothers, thousands of years, and in a matter of less than two hundred we are pretty much unaware of how to provide ourselves with our most basic needs, whether it is the raw materials or what to do with them when we have them. A few thousand years ago, no one really knows how many, a woman, no one knows who, romanced some flour, water, warmth, salt and the passage of time. Leavened bread was born from her labors and humanity prospered, until recently, without instant yeast, distilled white vinegar or takeout. But I’m not taking you to task for this, the real reason I’m sharing the secret is for you to find out how good, how much better, old fashioned food tastes and feels! If you’re looking for me to spill all the beans here, there’s no way for me to do it in one post, especially since I am still a novice at this bread thing. So, I will reveal a little of my story and then save more of the mystery for later. 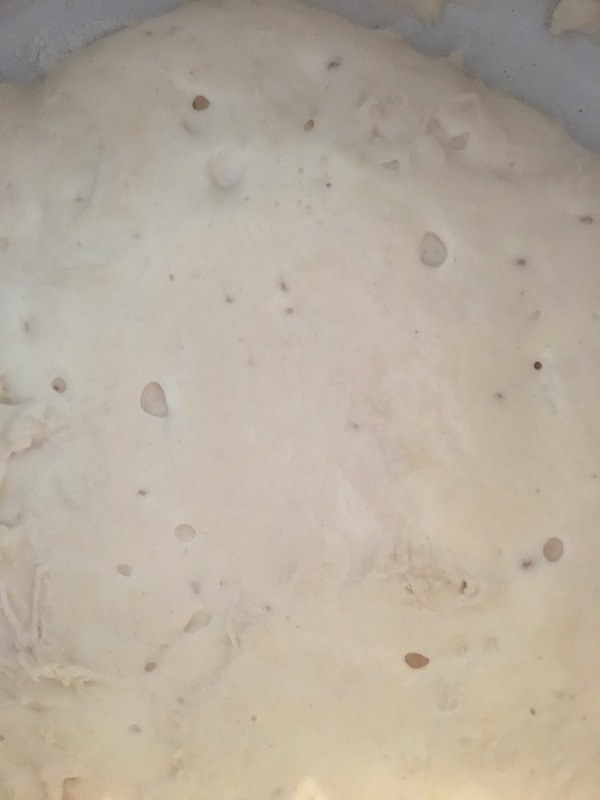 The bubbles on top of my biga, a stiff sourdough starter, are a sign that it is ready to use to make bread dough. After a whole lot of internet surfing, I tried the King Arthur Flour blog. I read through the article more than a couple of times and have managed to cultivate some sourdough starter that I kept going for about a month. I baked a few loaves with wildly differing outcomes and a whole lot of what I felt was wasted flour. So, to avoid more waste and frustration, I decided that I needed to actually study the subject. I went to the bookstore and selected The Sullivan Street Bakery Cookbook by Jim Lahey. So far I made the Tuscan Loaf which was mouth watering for me, although my husband complained about the hard crust. Right now I have a new biga bubbling, that I will use this evening to start a loaf of basic white sourdough that, if all goes well and timely, will be ready for dinner tomorrow night. I will leave you with this tidbit and a promise to write more on the whole subject. Commercial yeast, or instant yeast, that you add to your bread to make it rise in an hour or two, has only been in use for less than a couple of centuries. Before that the baker grew yeast from flour and water and salt. The slower process of fermentation can take days, especially in winter, and is much less predictable, but pretty much pre-digests the gluten in your bread….